Timeless colors of blue and soft yellow are sure to brighten any bedroom! A cheerful design that is rarely available. Nicely made with lovely hand quilting. Made in Lancaster County, Pennsylvania by an Amish woman. A popular design by Judy Martin. A breathtaking quilt inspired by nature! Gorgeous colors of a crisp, Autumn day in North America. 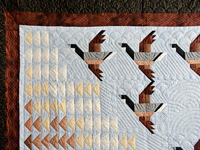 8 geese, so realistic you can almost hear them calling to each other, take flight in the clear blue sky among pieced triangles traditionally called "flying geese." What a clever design! 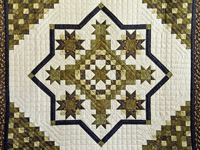 Very well pieced and hand quilted by an Amish woman in her Lancaster County, Pennsylvania home. 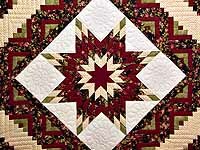 A stunning quilt with some rich colored fabrics.The Log Cabin quilt design is one of the oldest and best loved of all quilts. Here is a classic design made new! 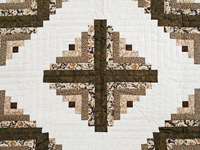 Featured on this quilt are rich colored fabrics of olive green, tan, black with brown centers on the log cabin patch. 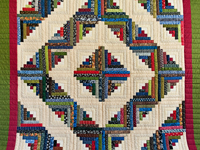 Very nicely pieced and beautifully hand quilted by an Amish woman in her home. 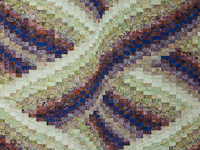 This Twisted Bargello is one of C Jean Horst's many carefully selected palettes of fabrics. 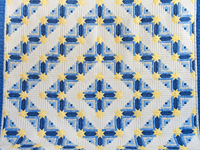 This quilt makes any bed a spectacular view of 20 different 100% cotton batik print fabrics that work well together like a charm. Imagine piecing this pattern. It is one of those "think twice and cut once" kind of quilt patterns. Magnificent while charming and appealing to the eye. We love this look over the pillow throw. Just a beauty on the bed! A truly cozy quilt! The Log Cabin is a traditional favorite. This one is multi-colored with many different fabrics. The border is a rich olive green. Would make a great Christmas quilt or could be used anytime of the year. Well made by an Amish woman in her Lancaster County, Pennsylvania home. Sure to be a treasured quilt for someone of Irish heritage, or anyone! 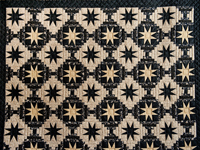 Features a stunning new star pattern! Lovely fabrics of green and neutrals. 8 tiny, even stitches of hand quilting per inch. Very well made by an Amish woman in her Lancaster County, Pennsylvania home. 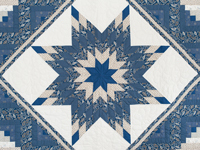 This quilt would look amazing on a large wall! 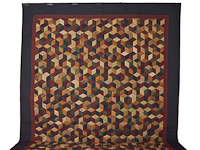 Rich burgundy, green, navy and gold tones make this classic Tumbling Blocks a winner. Another wonderful creation of C Jean Horst. Excellent patchwork piecing and lots of fine quilting. Made by Lancaster County Amish woman. This quilt is square and has been pre-shrunk.